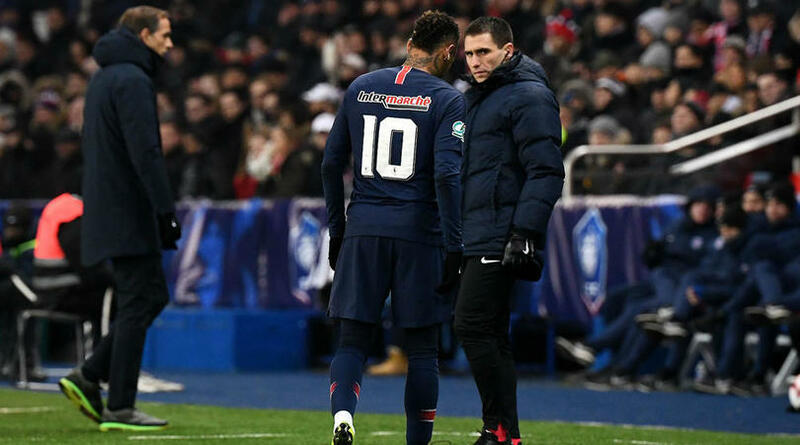 Paris Saint-Germain coach Thomas Tuchel admitted he was ‘worried’ after Neymar was sent to hospital with another foot injury sustained in the Coupe de France round-of-32 win over Strasbourg. Neymar withdrew himself in the second half of PSG’s 2-0 victory, having appeared to twist his right foot following a robust challenge from midfielder Moataz Zemzemi. Having continued at first, the Brazilian came off for treatment and returned briefly before hobbling off down the tunnel. Tuchel later confirmed that the Brazilian was sent to hospital and PSG were anxiously waiting for the injury verdict. ‘No, I did not talk to Neymar [after the game] because he’s in the hospital,’ Tuchel told Eurosport after the match. ‘Yes, I’m worried. It’s always complicated [with these kind of injuries]. PSG face a revitalised Manchester United under Ole Gunnar Solskjaer in the first leg of their Champions League last-16 tie in less than three weeks’ time.